Uncle Goose‘s new set of nautical blocks are made from sustainable U.S. beechwood with child-friendly, non-toxic inks — and the kid in us is excited to get our hands on them. 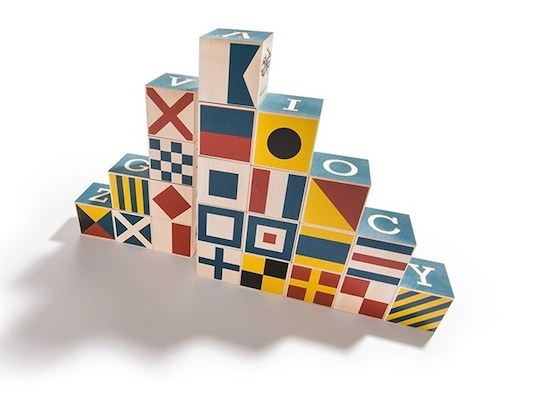 The set includes 26 letters of the alphabet, and the learning continues on all the other block sides with brightly colored geometric maritime signal flags, the alphabet in Morse code, and NATO phonetic alphabet words (think delta for “d”, tango for “t”). There are also real flag semaphore signals for conveying information at a distance, and each block contains a handy dandy depiction for tying a specific kind of knot. We often say that blocks will keep kids busy for hours, and that’s never been truer with this set: little ones will still love stacking and sorting, but older family members will get a kick out of practicing some of the flag hand signals or learning a new knot. The set comes with a canvas carrying bag, so feel free to bring the blocks when you go out boating (or just out to dinner). Uncle Goose's new set of nautical blocks are made from sustainable U.S. beechwood with child-friendly, non-toxic inks -- and the kid in us is excited to get our hands on them. The set includes 26 letters of the alphabet, and the learning continues on all the other block sides with brightly colored geometric maritime signal flags, the alphabet in Morse code, and NATO phonetic alphabet words (think delta for "d", tango for "t"). There are also real flag semaphore signals for conveying information at a distance, and each block contains a handy dandy depiction for tying a specific kind of knot. We often say that blocks will keep kids busy for hours, and that's never been truer with this set: little ones will still love stacking and sorting, but older family members will get a kick out of practicing some of the flag hand signals or learning a new knot. The set comes with a canvas carrying bag, so feel free to bring the blocks when you go out boating (or just out to dinner).